Maybe you folks can help me with this. I figure the more people that are researching a subject the quicker we can find the answer and the more information we can gather. Think of this as a homework assignment. No, you won't be graded on it, but you will enjoy the respect and thanks of your peers......or at least me. Does anyone else remember when George W. Bush created the Department of Homeland Security? Does anyone remember what we were told was the reason for needing this added layer of bureaucracy? Perhaps a brief history is in order; After the 9/11 attacks there was much Monday-morning quarterbacking, as one might expect. How could this have happened? Why didn't we know about this beforehand, so that we could stop it? Where were our intelligence/investigative/protection agencies before and during all this? Good questions. Legitimate questions. However, as seems to always be the case, someone determined that the answer was...........wait for it............MORE GOVERNMENT! 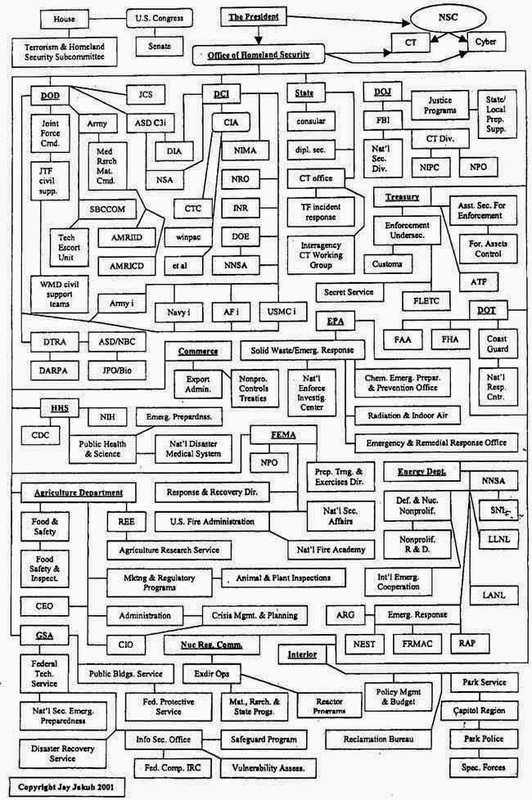 We were told that the problem was that each of our many "Alphabet Agencies" had certain pieces of the puzzle, but that they did not/would not share that information, thus putting the puzzle together beforehand and allowing them to move in and stop the attacks before they happened. You've seen it on ALL the police TV shows: One department does not share information with another, or even one detective with another, because they want their department/detective to get the credit for the arrest. You see, it makes them look better and makes them the heroes, not someone else. So, the thinking was that if we had a Department of Homeland Security, another government agency, that this problem would be solved. The thinking was that the various agencies could then use the DHS as a sort of "clearinghouse" for sharing information that would allow them to put the pieces of a puzzle together faster next time. Now you might ask, if government agencies didn't want to share information before why would they want to share now, with another government agency? Stop thinking and asking questions and just be a good little subject why don't you. OK, so you have a brief idea of what led up to the creation of the DHS and what it was supposed to accomplish, right? Now for your homework assignment; Over the intervening years we have seen the occasional news story about how the government has thwarted yet another potential terror attack on U.S. soil. It usually involves one agency, which makes the arrests to much fanfare, so that the American public will know that their "protectors" are on the job. Now remember, these are agencies which do not like to share and which will run over their dear old grandmother to get the credit for making these arrests. Can anyone of you remember hearing that the DHS had made one of these arrests? Can you remember hearing that the DHS had contributed in any way to the stopping of one of these potential terror attacks? I ask in all sincerity, because my memory is not pulling up that information. No, in each of these cases it is the FBI which has made the arrests and gotten the accolades (Of course the entrapment techniques used by the FBI raise all sorts of other questions, but that's a different topic for another time). Now wasn't it me, and many others, who were trying to tell people that we didn't need the DHS, that extra level of bureaucracy, that extra draw on our tax dollars, that extra agency that would not share information or have information shared with it? Wasn't it me, and others, who was saying that this is the job of the FBI and that they should be encouraged to do their job? I mean seriously, if the DHS had had anything to do with any of these arrests, knowing what we know about the need of these people to gather all the glory unto themselves, don't you think we would have been told what a pivotal role the DHS had in any of these arrests? So I ask you, can you find any examples of the DHS having been given credit for any of these arrests? If the DHS had taken a role in any of them don't you think that we would have been told, ad naseum, about it, thus justifying its existence? The question then becomes, given the current debate in Washington, D.C. about funding this agency, why do we need the DHS at all? Of course the same question could be asked about a great many government agencies, but then you all know the answer to that. Don't you.